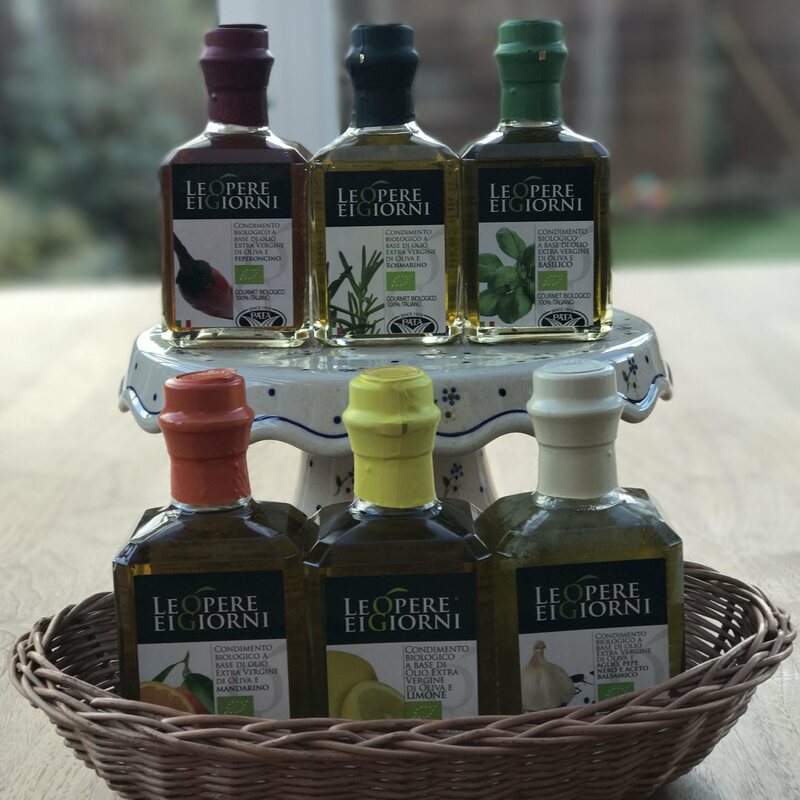 A handmade wicker basket containing your choice of 3 infused extra virgin organic olive oils. All the olive oils are made from completely organic, 100% traceable, mono-cultivar Ottobratica olives from a single estate. The oils are full of antioxidants and also muster the extra health benefits of the herbs and fruits with which they are infused. They are created by traditional, natural processes whereby the fruit and/or herb is selected and pressed together with the olives. The basket may be different from the shown pictures. Garlic, Black Pepper And Balsamic: 93% Extra Virgin Organic Olive Oil, 3% Organic Garlic, 2% Balsamic Vinegar, 2% Organic Black Pepper. Chilli: 97% Extra Virgin Organic Olive Oil, 3% Organic Chilli. Basil: 97% Extra Virgin Organic Olive Oil, 3% Organic Basil. Rosemary: 97% Extra Virgin Organic Olive Oil, 3% Organic Rosemary. Mandarin: 97% Extra Virgin Organic Olive Oil, 3% Organic Mandarin. 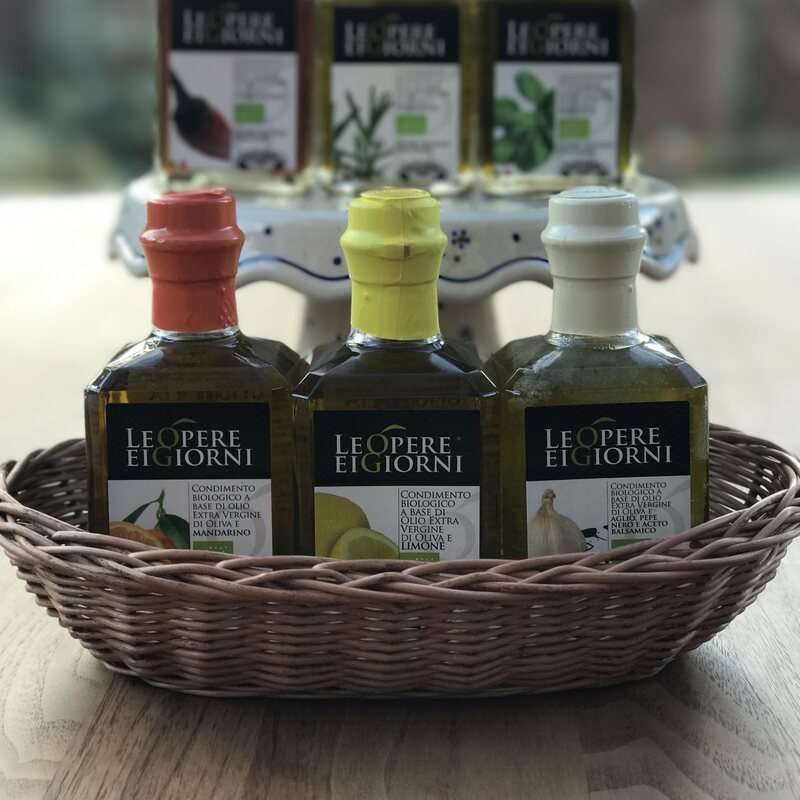 Lemon: 97% Organic Extra Virgin Olive Oil, 3% Organic Lemon.